It’s been a week since our Perth weekend adventure! We were there for the long weekend (Queen’s birthday), and I’m still reveling at the memories of all the awesome things we got up to during our short time tnone of that here. Those who followed the shenanigans adventures over at Facebook, Instagram and Twitter have been wondering how I was able to do so much in so little time. Ha! How I’d love to say that its thanks to “a healthy diet, good exercise and long hours of sleep”, but none of that applies to my lifestyle at the moment. I always believe that when you travel, where you stay will make or break your experience. 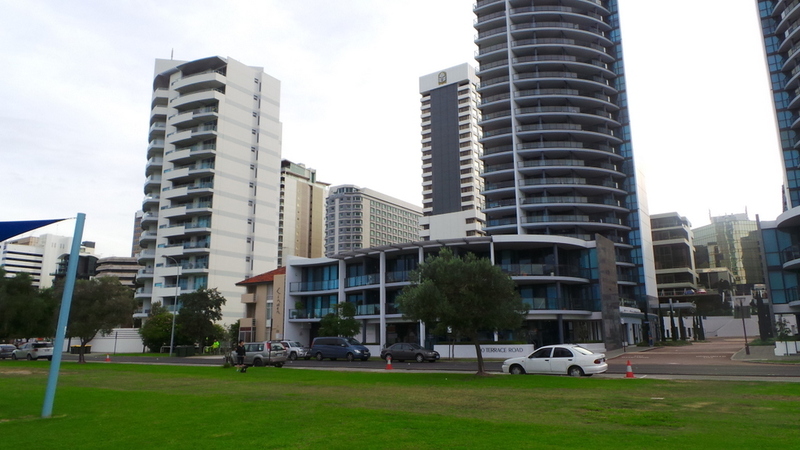 And for our short stay in Perth, The Pan Pacific Hotel Perth proved the ideal host and location for all our activities. 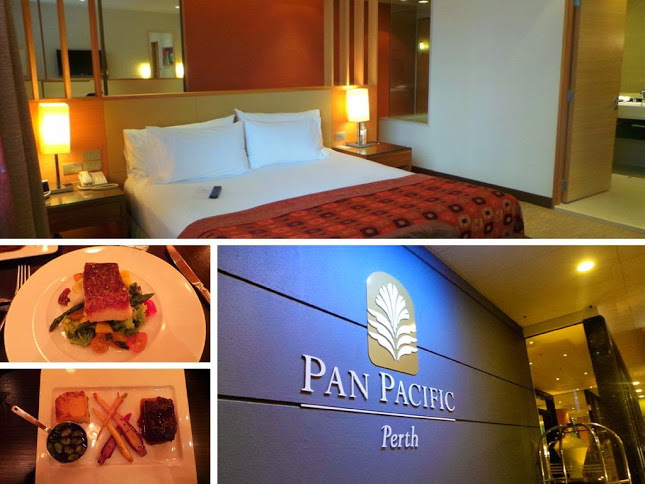 Pan Pacific Perth is about 20 minutes by cab from the airport. 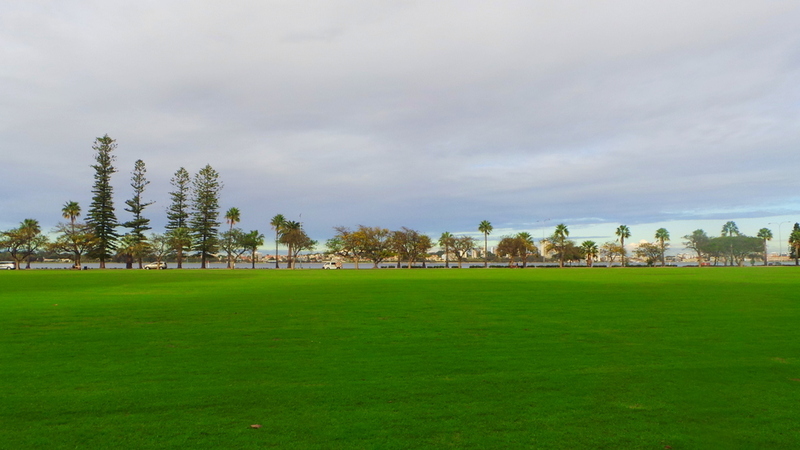 Overlooking the nice stretch of the Swan River, you also have Langley Park as the “backyard”. 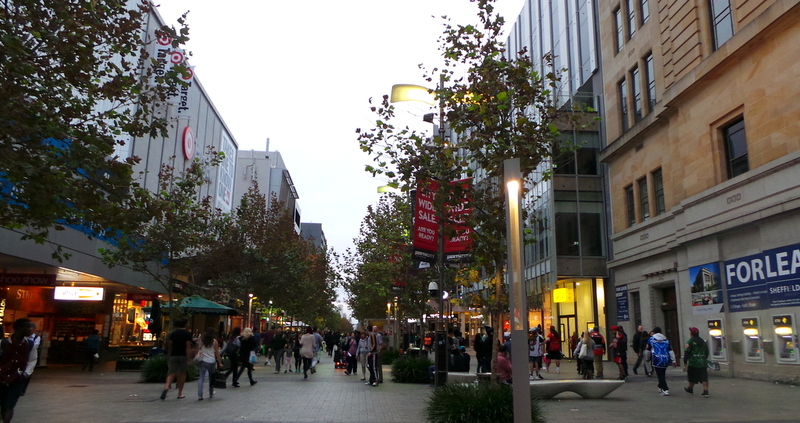 And it takes about 10-15 minutes to walk from the hotel to the CBD for restaurants, shops and malls like Carillon City where high street labels are. Once our cab reached the curb of the hotel, there was immediate assistance from hotel staff. Because we only carried small weekend bags, we managed to carry our things by ourselves. But the pro-activeness to assist was much appreciated. We arrived close to 2PM, there was a group ahead of us checking in and the wait was only 5 minutes. 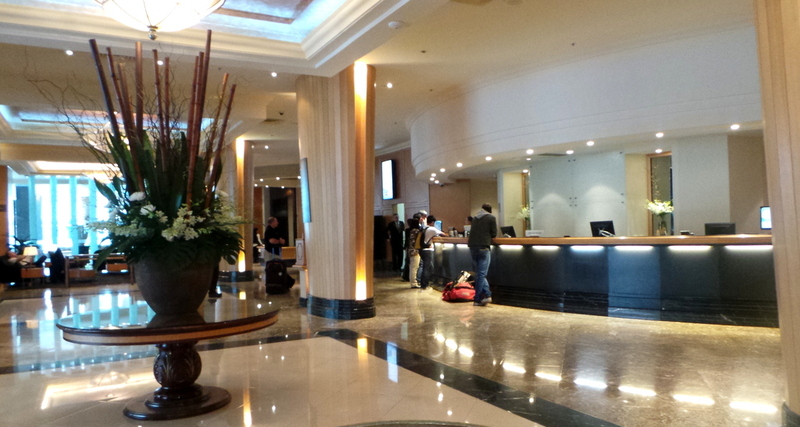 The check-in staff was very friendly and accommodating. 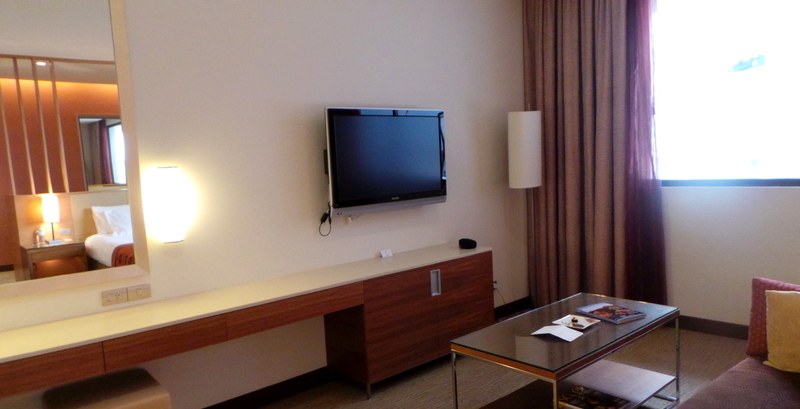 As we had been booked a Pacific Club level room, we were briefed with the privileges and services that come with it. So What are the Privileges of being booked at a Pacific Club Level Room? There is an exclusive lift area dedicated to members of the Pacific Club, and also guests booked at rooms on the Pacific Club level. The room we were checked into was a Pacific Club King Room. 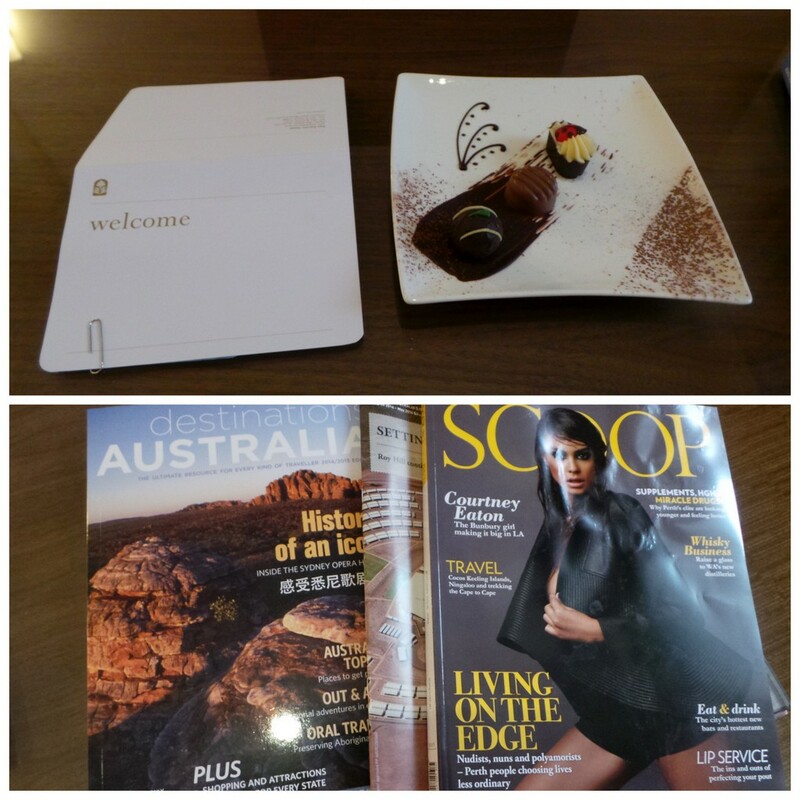 There was a basic welcome amenity of a welcome note from the Rooms Divisions Manager, and a platter of chocolates. Magazine selections consisted of Australian travel, business, and lifestyle. This glass panelled open bathroom plan also served as the hallway entry ‘wall’ upon entrance of the room. 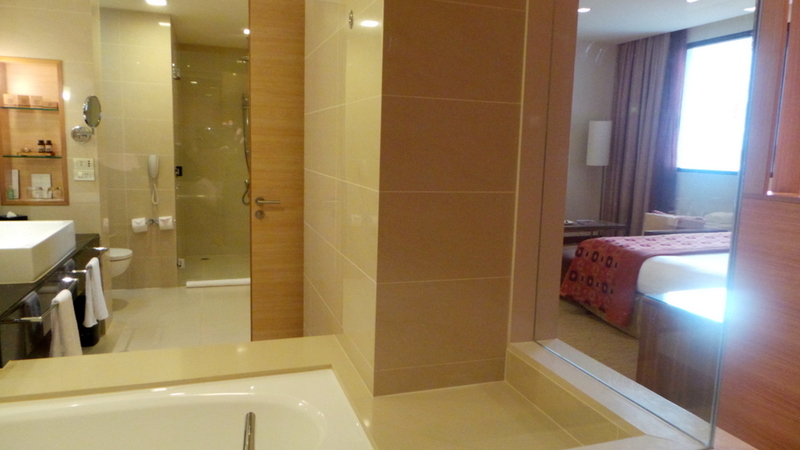 I do like this open plan of bathrooms that have been emerging among modern hotels. It gives a very open atmosphere and a feeling of more space. Of course, this will only work if you are travelling by yourself or with your partner/spouse. The king-sized bed was very comfortable. The pillows plush and firm enough for me to only need 2. (I normally take on the extra pillow offered). The study is also cleverly situated behind the bed headboard, where that area also serves as dressing/wardrobe space. The room has a flat-screen tv and due to the grand size of the room, the TV, which was normal sized, seemed tiny in comparison. 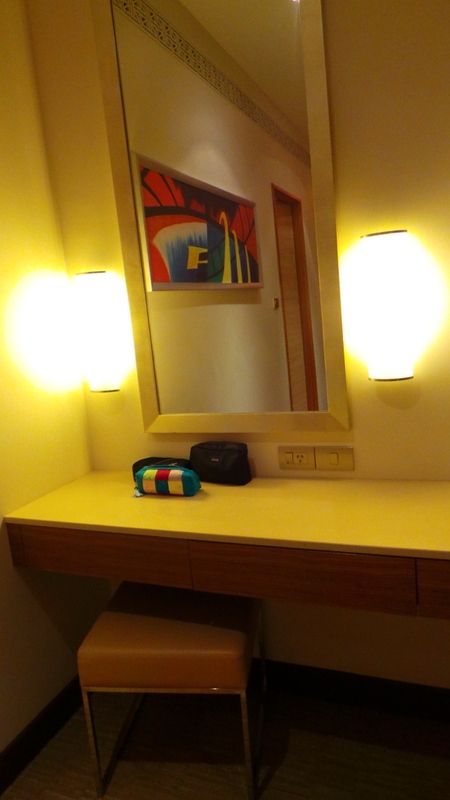 I liked that the room has a dedicated makeup/ getting ready area which has a power socket too. Speaking of power sockets, that’s one thing that the room is abundant of. There are powerplugs just about everywhere. On either side of the bed, and there’s also a charging station with at least 4 plugs in the study desk just behind the bed. And while there was no proper turn-down service, I noticed that there was a generous provision of complimentary bottled water. 2 Per person everyday. I really liked this. It’s a small and often overlooked detail, but complimentary water (and not the tiny bottles) are quite a staple in luxury hotels but not all are this thoughtful/generous. I just realised that by showing you the “entry hallway” (first hotel room photo above), I have also inadvertently shown you the bathroom and its layout. But here it is again, with more detail. 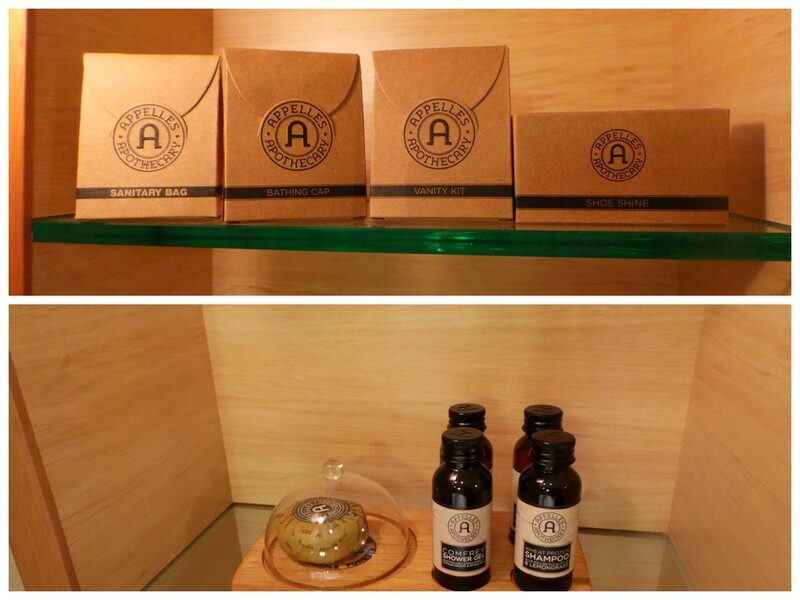 Bathroom amenities and toiletries are from Appelle’s Apothecary, an Australian brand that is growing on me. (I first discovered them at the Sebel Manly). I love the very menthol-ly shampoo. And because videos will always show a better dimension of rooms than any other photograph can, we’ve done a hotel/room tour video. 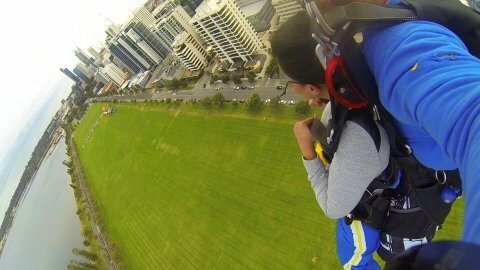 And yes, one of the greatest things about the Pan Pacific Perth is its proximity to Langley Park, where we pretty much landed on our skydive! This park was also the pick up point of our skydive, so I felt like I just walked out of the hotel, got picked up, hopped on a plane, jumped, and landed back into the hotel’s backyard! Forget a limousine service, this is the grandest way to be dropped off at your hotel! There are 2 main restaurants in Pan Pacific Hotel Perth. Monterey’s is the main one that is open 7 days of the week for breakfast, lunch and dinner. 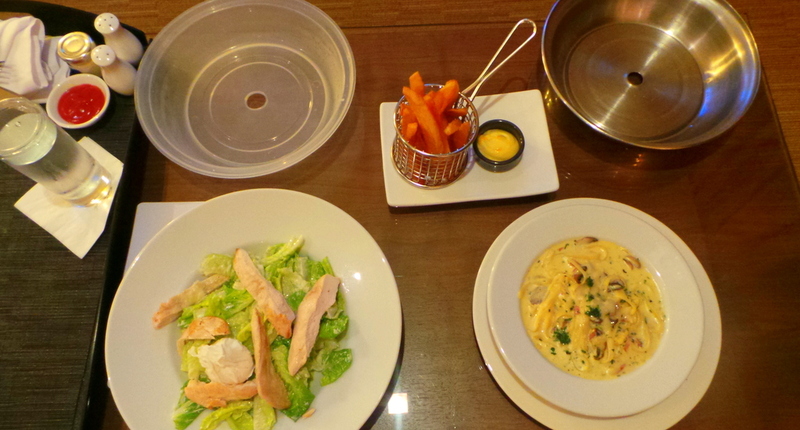 Both buffet and ala carte choices are available. 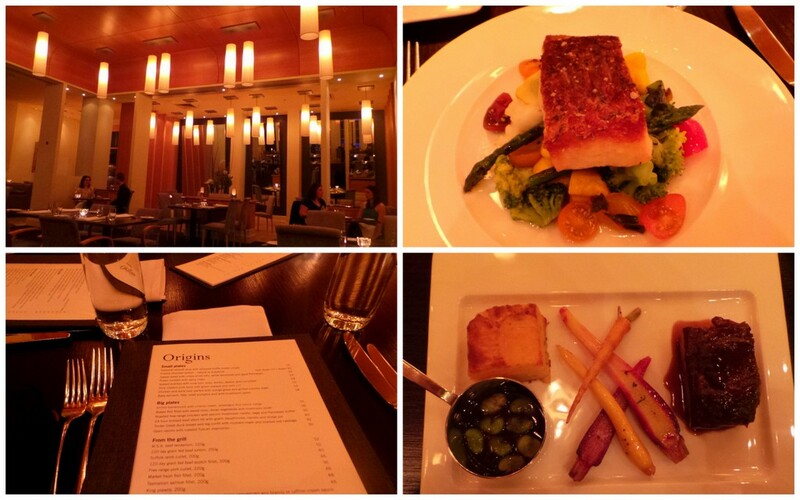 Origins is the option for a more formal dining experience, and here’s where we enjoyed dinner on our first night. It was a pretty quiet and intimate setting, and I truly enjoyed my dinner of Grilled Barramundi with roasted vegetables. Zombie had the Prime Rib. They are also pretty flexible if you would like to choose different sides to come with your mains. Origins Restaurant is also located next to the hotel pool, and during the afternoons, every weekend from 2PM- 5PM, Origins is also the location for Pan Pacific Perth’s High Tea setting. Origins proved to be a very versatile setting. Intimate and quiet by night for dinners, and light and airy in the afternoon for high tea. I’d just gotten back from Rottnest Island that afternoon. You didn’t expect me to leave the island empty-handed, did you? 🙂 (yes I’m talking about the Quokka!) If you don’t know who she is, read all about my dream weekend in Perth. 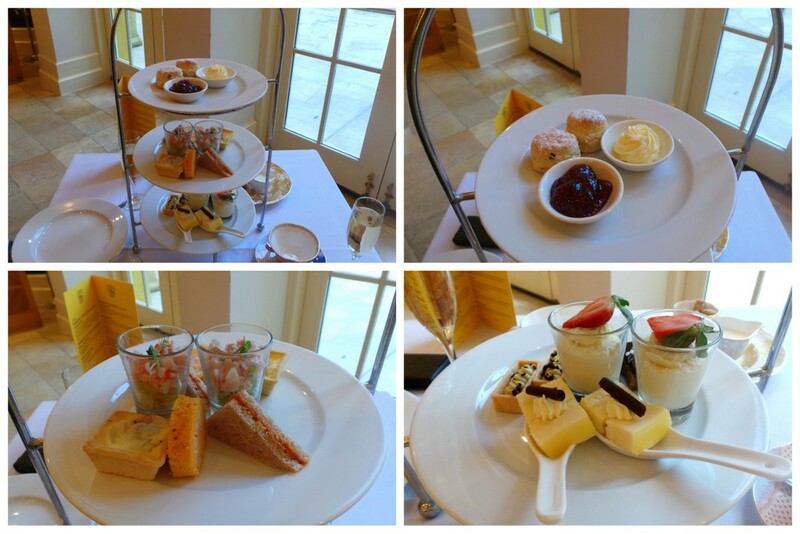 As customary for an English Afternoon tea, we were presented with a variety of finger foods. If Dante (Alighieri) has his 9 circles of hell in Inferno, this would be my personal 3 layers to heaven! And the tea of course. I love teas and their tea selection , by TWG (The Wellness Group) has a good variety, ranging from the classic English choices, to your Orientals, Fruity, and Bush teas. 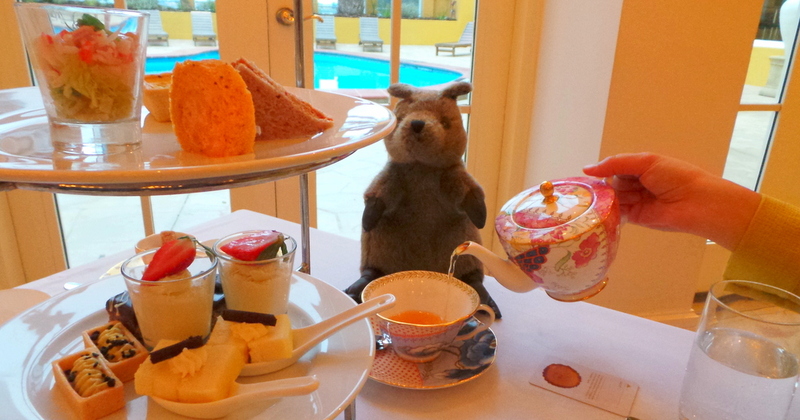 Afternoon High Tea at Pan Pacific Perth. Lupita peeking at you. I love a good South African Bush tea especially in rainy days (such as this afternoon), so I had my bush tea with a hint of lemon. 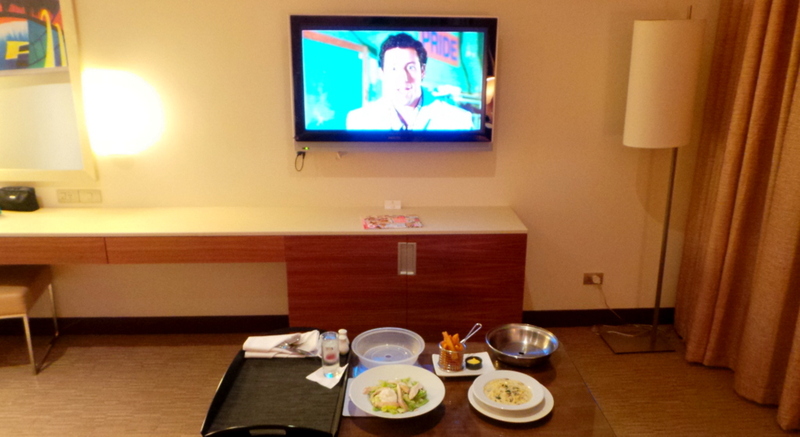 And then there are times you just want to enjoy the room and eat while watching TV, right? Especially after high tea, we didn’t feel like eating until about 10PM. Everybody was courteous, and always greeted us whenever we passed by walkways, etc. But as with all establishments, there is one group of people who delivered really great service that makes them stand out from the rest. In our visit, we were very impressed with the Concierge team. Neil and his team delivered exceptional customer service. For one, he was quite patient and informative in helping us decide if we should go ahead and visit Rottnest Island given a very short time frame. He shared to us his personal experience in the island and gave some tips, and eventually we decided to go ahead (which ended up being one of the most memorable wildlife experience we’ve had). Another instance was when returning from dinner one night, we wanted to speak to the Concierge team once more , but there was a small incident involving one of the guests of a wedding at the hotel. A woman seemed to have sprained her ankle and there were ambulance and emergency staff inside the hotel, and she was on a stretcher which happened to be placed right in front of the concierge desk. There were many on-lookers and mild fuss happening. We sat down at the lounge area to wait for the commotion to die down (they seemed to be in the process of whisking her away), and we were happy to sit and approach the concierge desk when all the fanfare had gone. But one of the concierge staff actually approached us, and seemed to know that that was exactly what we were doing, and actually attended to our query to us while at the lounge area. These are simple details but to me, they are note worthy as it speaks of people who take a proactive approach, pride and enthusiasm for their job. 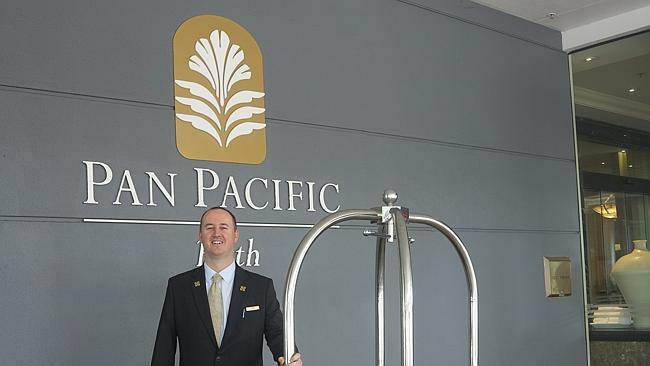 Overall, I would recommend Pan Pacific Perth to both business and leisure travellers. 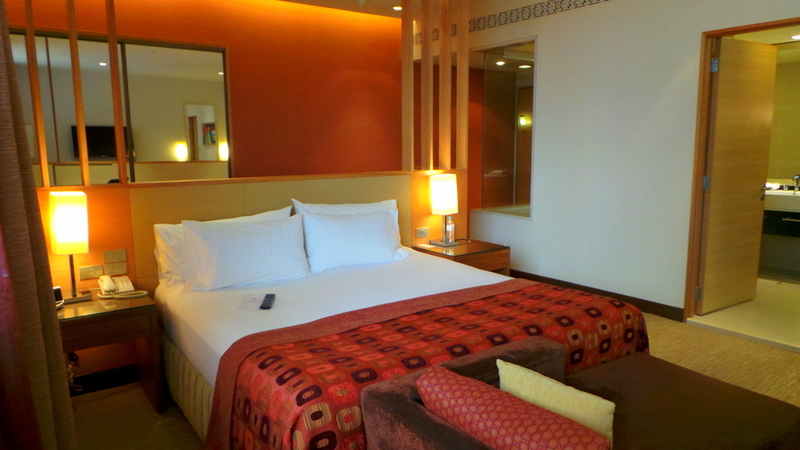 For business travellers , booking a Pacific Club level room would be helpful most especially as it is in a quieter, more exclusive area of the hotel. It was pretty quiet in the Pacific Club level, you’d be surprised to see how many people are actually in the hotel once you come out of the Pacific Club level “shell” and go to the main areas. 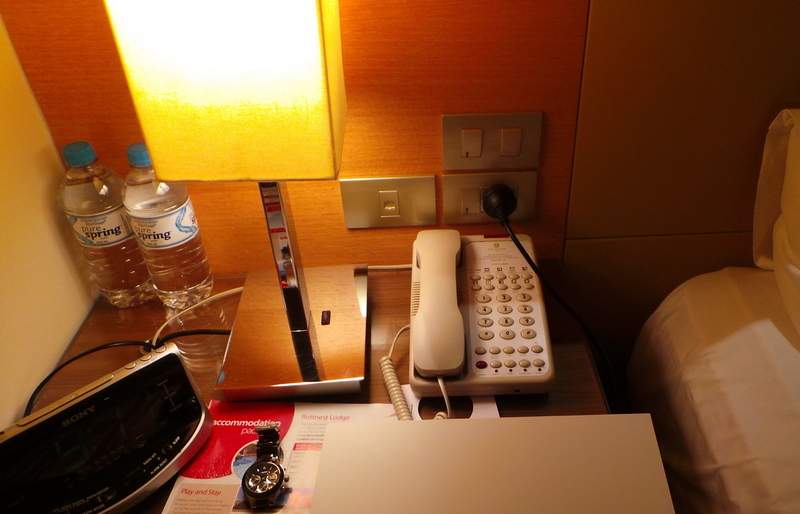 And we were able to do so much in limited time mainly due to having the proper accommodation. For one, it has good location which makes transport easy, and second, it offers a luxurious stay to comfort and pamper our aching joints (from all the touristy exploration and activity) at the end of the day. 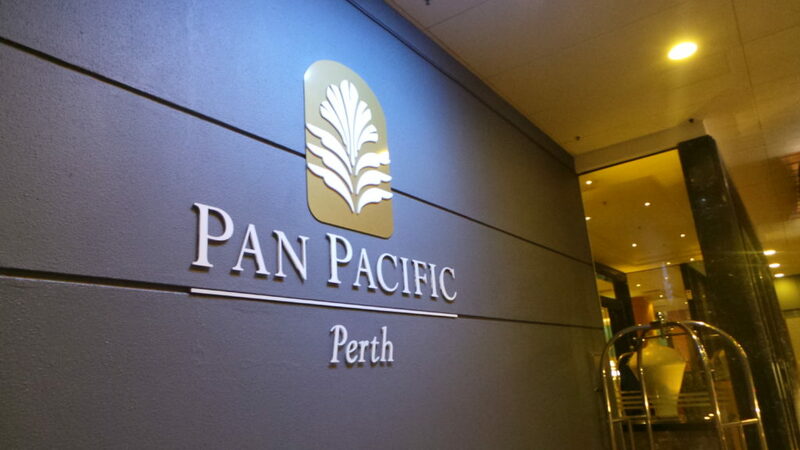 Pan Pacific Perth hosted us for the weekend, and also sponsored our flights from Sydney to Perth. We received this trip for winning a bloggers competition held in March by Pan Pacific Perth to write about the ideal weekend in Perth. You can read the entry Here. How important is a hotel’s location for you? When was the last time you had a short weekend getaway? The hotel looks beautiful and the food looks amazing! Glad to hear that you had a great time. Thanks Greg, yes though the stay was just for the weekend, we did have a great time 🙂 The barramundi was really nice! Looks great! And I love the room set-up! The video tour was also nice. Will be working in Perth for a while so might as well try out the best in the city, right? Thanks for this review!